Washington (CNN) The state of Donald Trump is unrepentant and defiant. And while he says he's open to compromise and national unity -- it must be on his terms. The President's annual State of the Union address on Tuesday held up a mirror for millions of television viewers of the rancorous, apparently unbridgeable ideological divides that hold Washington hostage and stifle a latent yearning for national unity. Yet at times, he offered a tantalizing promise of something more, conjuring moments of poignancy, as when he honored a World War II veteran and a Nazi concentration camp inmate the veteran helped liberate, together in the first lady's box. "I am asking you to choose greatness. No matter the trials we face, no matter the challenges to come, we must move go forward together. We must keep America first in our hearts," Trump said. He signaled no retreat on his most quintessential, and divisive, campaign pledge, saying, "walls work and walls save lives," and raising the specter of "caravans" of migrants massing for a "tremendous onslaught" on the border. "I will get it built," Trump said. The calls for unity appeared oddly dissonant from the President's fervent appeals to his base on immigration, abortion and a vow to make sure America never becomes a "socialist country." And on foreign policy and immigration there were characteristic falsehoods sprinkled along the way. The contradiction underlying the speech -- that is also a theme of Trump's entire presidency -- was evident midway through. "Matthew, on behalf of all Americans: Welcome home," Trump said. Yet the warmth from that special moment soon faded when the President pivoted directly to tales of "ruthless coyotes, cartels, drug dealers and human traffickers" that recalled the racially charged rhetoric of his campaign. Time and again, the kind of national unity for which Trump's scripted speech sometimes reached appeared on the verge of spontaneously breaking out. 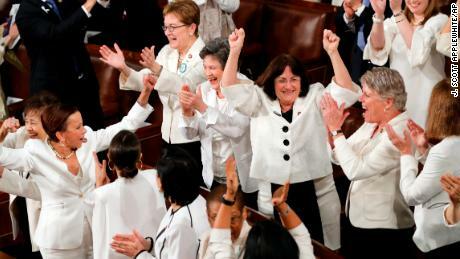 When Trump mentioned that 58% of newly created jobs had been filled by women, female Democratic lawmakers -- wearing white in a show of equality -- stood and cheered, effectively claiming the President's applause line for themselves. "You weren't meant to do that," Trump said with a showman's timing and in a gesture of generosity, reclaiming the moment. "Don't sit yet. You're going to like this," he said, before adding: "And exactly one century after Congress passed the constitutional amendment giving women the right to vote, we also have more women serving in Congress than at any time." rump came into the evening at one of the weakest moments of his presidency. He came off second best in his government shutdown showdown with Pelosi. He is in a box of his own making over the wall -- and may be forced to trigger a constitutional conflagration by using executive power to get money to build it. "An economic miracle is taking place in the United States and the only thing that can stop it are foolish wars, politics or ridiculous partisan investigations," Trump said. In an echo of President Richard Nixon who declared in 1974, that "one year of Watergate is enough," Trump warned: "If there is going to be peace and legislation, there cannot be war and investigation." To Trump's left, Republicans raucously cheered like a campaign trail crowd, sometimes chanting "USA, USA!" The evening was a clear sign from Trump that for all the speculation that he could finally broaden his appeal and court all Americans, his political course -- solidifying his base -- is set and irreversible heading into the 2020 election. That's rarely the case for Trump. The most authentic version of the President is usually to be found on his Twitter feed or in spontaneous remarks so his behavior in the days ahead could well undermine his calls for unity. The President's most poetic call for national unity came when he decried the toxic politics in Washington that jarred with his opening line that everyone was gathered "not as two parties but as one nation." "We must reject the politics of revenge, resistance and retribution," the President said. If he can live up to his own admonition, the unifying sentiments of his address may prove to be more resilient than the President's own recent history suggests will be the case.